It really is arguably the biggest challenge parents are facing today. How do you limit the amount of screen time your child is getting so they don’t end up numb to the world and turning into a couch potato!? Nearly every friend I have is having exactly the same issue with their kids, and their friends are having the same issues, so it’s reasonable to say that it’s pretty widespread. Our kids are entertaining themselves on screens, rather than using their imagination and creating entertainment. In my opinion, THIS is the issue. Kids are getting so used to being entertained that they’re relying on outside sources to keep them from being bored. There is no creative thinking going on and there is no problem solving. A little bit different from when I was little, growing up on a farm. Now at this risk of sounding like an old fuddy duddy here, I’m going to draw a comparison to my childhood verses what most kids are experiencing today, because there is such a stark difference and a lot of kids now are a lot more at a disadvantage, environmentally and socially. I HAD SPACE to roam around on a farm without mum circling around, trying to keep me safe. My brother, sister and I would spend the day outside building cubby houses, creating treasure hunts, making flying foxes, going on picnics. It was endless, exhilarating and adventurous. However, we had the outdoor space to roam and explore. It’s now a million times more challenging when most of us are living in small houses or apartments in the city, with kids unable to roam free because an adult would need to supervise them. Then when I moved from the farm as a teenager, WE HAD A COMMUNITY of friends close by where we would hang at each other’s places, rather than be under our parents feet all day. We would drop around and dance for hours, listen to music, play sport. It was endless, and our parents could get a break. PARENTS HAVE SO MANY TIME DEMANDS TODAY that looking after kids can be really exhausting. However, screen time can become an issue when kids become reliant on them and lose the capability to create and solve. They can also lose a lot of the micro moments, which are important for processing information and working things out. Often when will fill the silence or boredom with noise, we rob ourselves of these micro moments. So what’s the answer, how do we reduce screen time when we don’t have the time to entertain? I believe one of the answers is a lot easier than we think. It’s very simplistic but highly effective. But be warned, for a lot of kids it’s different to their usual go to and it requires a period of time where kids are weened off what they might be used to. It takes a bit of organizing, but our kids need a few small activities and hobbies to turn to on a regular basis. I call it the activity bucket. The bucket filled with things like cards, knuckle bones, paper, pencils, copying books, craft, fimo (like a plasticine), threads and a loom for bracelet making… the list goes on depending on what your child is interested in. From the paper they could make paper planes, treasure hunts, play hang man and noughts and crosses. Just make sure your kids participate in coming up with the ideas. What it requires is a bit of time to go to an office works or a 2-dollar shop with your kids and buy the materials. Then spend time setting up the bucket into small containers with the kids labelling the containers according to the activity. Finally, I recommend spending a bit of time to start with going through one activity. It’s important NOT to pull out all of the activities at once or you’ll find your kids will start an activity and then stop in a few minutes. The point is they need to spend some decent time on one activity. 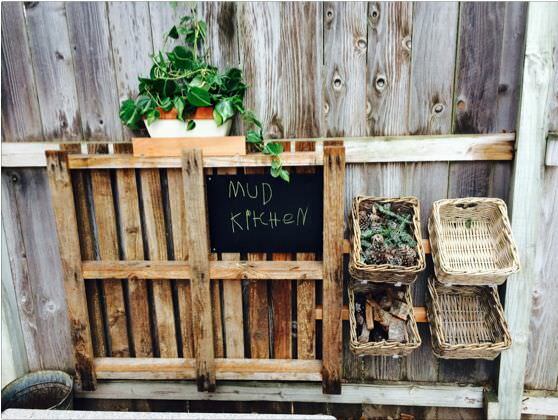 If you have a front or backyard the mud kitchen should get your kids creating for hours! All it requires is a little space, a wooden bench top, some pots and pans, water and dirt. Then you can add some cool little ideas like introducing a microscope for bug watching. I’m definitely not saying that this is the answer to solve all screen time, in fact new research suggests that some screen time can be beneficial. However, when you’re noticing that screen time is the norm, rather than the exception, that’s when a little go to can help. Then maybe once you feel they’ve had plenty of outdoor time where they’re been moving and getting fresh air and they’ve had plenty of creative time indoors, they might want to chill out a bit in front of a screen. My golden rule is the screen is a last resource once we’ve experienced the wonders of the day. Anyway, I’d love to get your thoughts on great ideas to keep your kids entertained.